Niro and his team focused on eliminating sound interferences to achieve ultimate clarity and localization of sound. This led to the creation of the HPS (patent pending) - a surround sound field that envelops the listener just like in a movie theatre. This enabled reproduction of sounds not only coming from the rear, but also spreading over a vertical expanse. The Niro HPS uses two enclosures that contain 5 meticulously engineered drivers as well as 5 super tweeters, plus a sub that reproduces a true 5.1 channel surround sound. 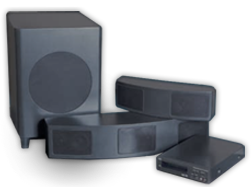 Separating the front speakers (FL + C + FR) from the surround sound speakers (LS + RS) and housing them in the bottom unit and top unit respectively, significantly improved the resolution of sounds generated by each speaker unit and enabled a delivery of very clear sounds to the listener. 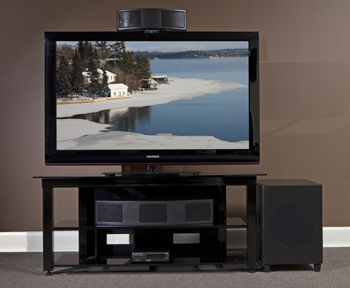 Furthermore, the placement of the surround sound speaker above the TV resulted in a substantially improved position accuracy of rear sound signals normally affected by reflections, thus allowing the listener to enjoy realistic sounds, hearing even those sounds that could not be picked up by conventional systems.